Service One Transportation Celebrates 20th Anniversary! To commemorate our 20th Anniversary, our Plymouth-based trucking company located between Green Bay and Milwaukee will be hosting a celebration at our annual driver appreciation lunch and open house this weekend. 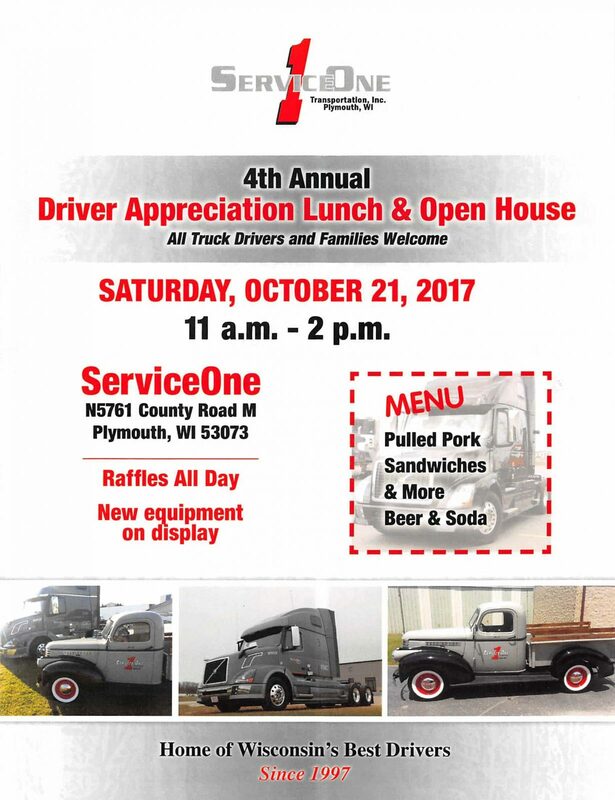 Company Truck Drivers and all CDL Holders and Their Families Invited to Attend our 4th Annual Driver Appreciation Lunch and Open House on Saturday, October 21, 2017. 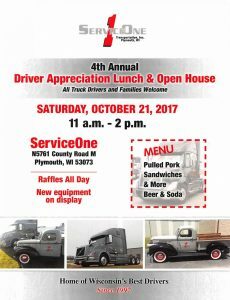 Service One’s 20th anniversary festivities will take place during the company’s 4th Annual Driver Appreciation Lunch and Open House on Saturday, October 21, 2017, from 11 a.m. to 2 p.m. The event is open to all Service One employees, drivers and their families, as well as anyone with a commercial driver’s license (CDL) who would like to learn more about available truck driving jobs. Guests will be treated to a lunch buffet featuring pulled pork sandwiches, beer, soft drinks and other items, and prize raffles will be held throughout the day. Service One will also have its newest equipment on display, including two 2018 Kenworth T680 trucks. “This annual event gives us an opportunity to thank all of the people who have made Service One the leading trucking company in Wisconsin. On this special anniversary, I’d also like to recognize two original employees who have been with us since the beginning. Our office manager, Diane Mueller, and our first driver, Tim Schiesel, will be celebrating 20 years with Service One—and I couldn’t be more honored and grateful to call them part of the family,” said Dan Flagstad, Jr., President of Service One Transportation.